The Gold Coast stretches for about 60 miles (97km) down Florida's southeast coast, from Palm Beach in the north to Miami Beach in the south. 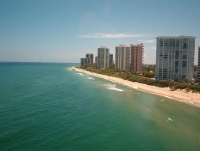 This stretch of coastline is hosts a string of tropical beach resorts which are very popular with visitors to Florida. The Gold Coast strip currently attracts close on nine million holidaymakers every year. Development is proceeding apace as the natural landscape of sprawling grassland is replaced with opulent resorts and high-rise apartment blocks. The larger resort cities along the coast, West Palm Beach, Fort Lauderdale and Hollywood, are experiencing unprecedented building booms as the number of immigrants rises. Visitors and residents alike come to enjoy the natural attractions of the area, the laid-back atmosphere, the almost constant warm, sunny weather, the luxurious 'country-club' lifestyle, and the hundreds of sophisticated shopping malls. The best way to explore it all is to take a meander by car along Florida A1A, a narrow road that winds along the coast connecting the long thin barrier islands. Alternatively, pick a resort, kick off your shoes and enjoy a summer vacation, any time of year.